I love a great pot of soup that’s good enough for company or simple enough for lunch or dinner any day of the week. 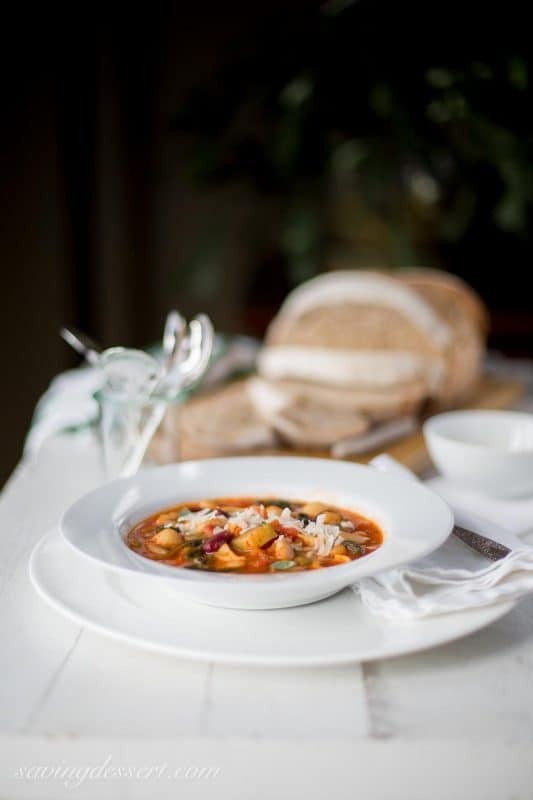 Our Minestrone Soup is best served with a loaf of crusty bread and a sprinkle of fresh grated Parmesan cheese. I’ve posted a lot of soups this year and you may wonder if they all taste similar. Some have a few of the same ingredients, i.e. carrots and celery and fresh leafy greens. But I don’t believe they taste similar at all and this particular recipe has an incredibly rich flavor that is synonymous with authentic Italian cuisine. I haven’t made this soup in many years but decided to give it a serious makeover … with tremendous results! Served with crusty bread and fresh grated Parmesan cheese, this is a complete and filling, healthy meal. You can smell the amazing flavor before tasting the very first spoonful. The aroma is homey and fresh and may transport you to a small Italian bistro with white table cloths and bottles of red wine. A mini-vacation! Leftovers may be even better than the first bowl. I think I’ll need to try another and let you know. Heat the olive oil in a large heavy bottom soup pot on medium heat. Add the onion and sauté until translucent and soft. Add the minced garlic and sauté for 1 minute, stirring constantly. Immediately add the zucchini, carrots, celery, and all spices except bay leaf. Cook, stirring gently for about 2-3 minutes or until the oil has coated all the vegetables. Add the Vegetable broth, tomatoes with juice, Passata, hot water, and bay leaf. Bring to a boil, reduce the heat to maintain a simmer and cook, uncovered, for 30 minutes, stirring occasionally. Add the green beans, kidney beans, cannellini beans, garbanzo beans, baby spinach and pasta. Cook until the pasta is al dente - about 15 minutes. Remove and discard the bay leaf. Check the seasoning and add fresh ground pepper and salt if needed. Garnish individual bowls with fresh grated Parmesan cheese and serve. You hit this out of the park with this recipe! 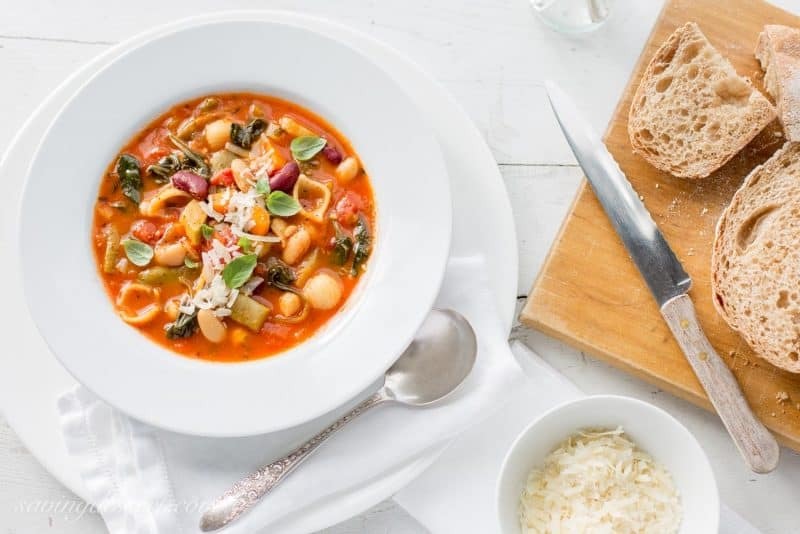 This is the best minestrone I’ve had! I didn’t have the Passata so I substituted 1 small can of tomato paste. The recipe was simple, yet very tasty. Good mix of spices, veggies, and legumes. I will definitely make this again! Thank you so much Mike! I adore this soup and could eat it once a week. Thanks for giving it a try and for taking the time to comment! This soup looks so beautiful and colorful! It’tastes simply wonderful! I have never used Pasada before . I think it really adds to the freshness of the soup. My adult daughter loves Minestroni soup so will have her try this! Thank you Sharon! I’m always looking for ways to incorporate Passata because it has such great tomato flavor. Thanks for giving this recipe a trying, and for letting us know how it turned out for you. I made this a couple weeks ago but had to use tomato sauce instead of passata; otherwise, everything was the same as your recipe. It was the best minestrone soup I’ve ever had…delicious! Even my son, who isn’t a big fan of soup, loved it. Yesterday I found passata at our local grocery store, so I’m going to make it again this weekend. We got almost a foot of snow yesterday and it’s pretty cold here, so it’s a great time for a nice warm soup. Thank you for this wonderful recipe! I love this soup Karen and so glad you did too. Passata is one of those ingredients I was thrilled to find and use it often in soups and sauces. A foot of snow – I am so sorry. We’re in Virginia and are supposed to get a dusting or so tomorrow night. I am over winter this year – here’s to an early spring! Another winner…your blog is rapidly becoming my favourite food blog! Thank you so much Valerie – we aim to please! I really love this soup and may just make it for my daughter-in-law who is expecting a daughter soon. Great idea 🙂 Have a wonderful week and thanks for stopping by. Beautiful! 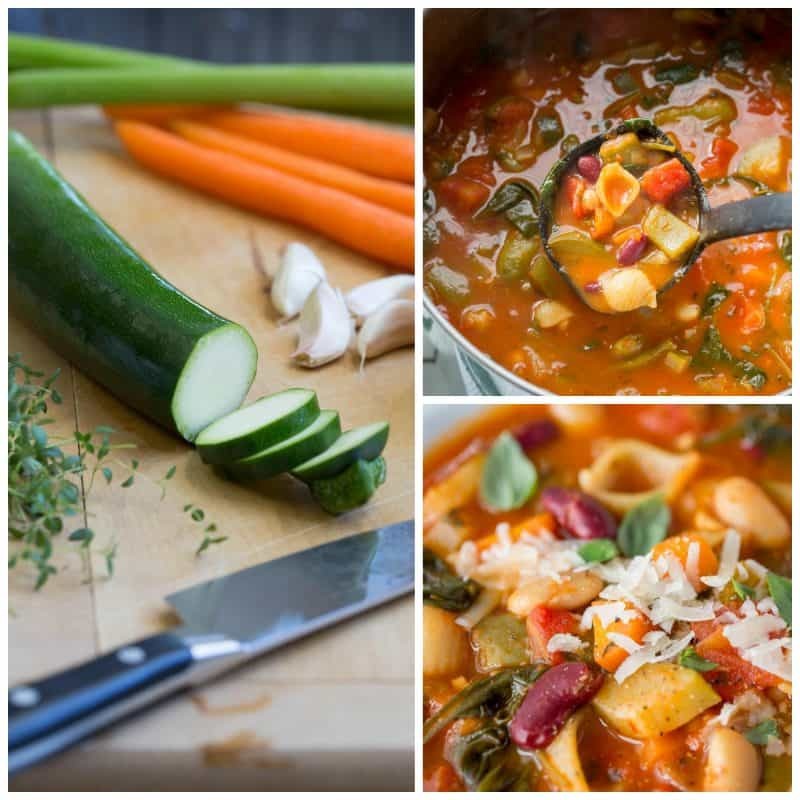 I love a hardy minestrone and the weather is perfect for it. Thank you Kate! I really love this soup and it kept very well. You say that you can smell the flavor before you taste it, but I swear I can see the flavor in these photos! The photos are delicious! Usually, I make “whatever is in the freezer/cabinet” soup, cooking an invented soup out of whatever we have on hand. 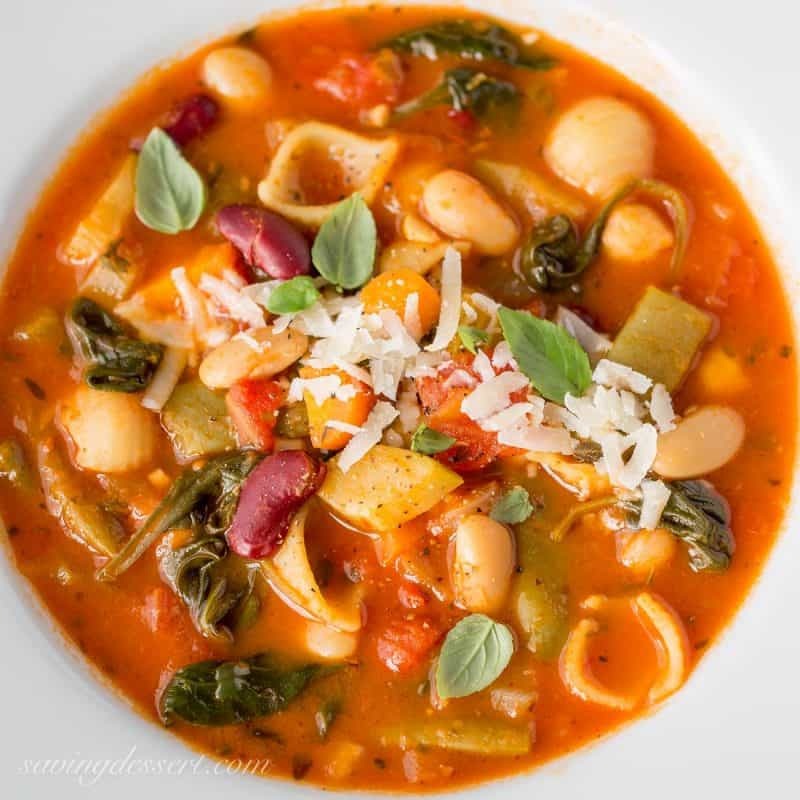 Minestrone soup is one of my husband’s favorites. He will be delighted to hear I plan to use a recipe this time! Thank you so much Wendy 🙂 I ate this soup for at least 5 days and it still tasted great. I love a big pot of soup that is good for a week of lunches! So filling and a true feel good soup! Wonderful. I haven’t made minestrone soup in ages and it’s a favourite of mine. A perfect midweek supper dish! Thanks Beth – I don’t know why we don’t have this soup more often. I ate leftovers all week and they were great each day. Have a super week! 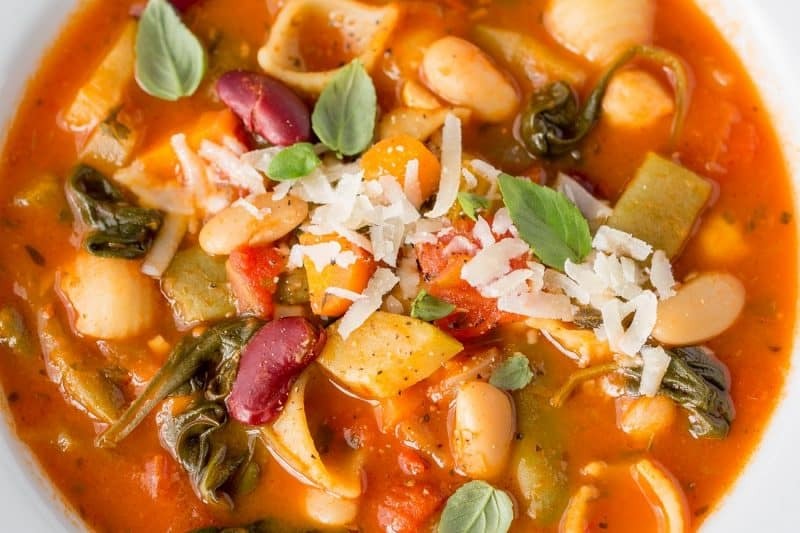 What a healthy and good looking minestrone . I love soup any time of the year. We’ve been making a ton of soups this year, too. And have a ton to go — it’s still pretty darn cold! Anyway, one of the things I love about herbs and spices is you can take the same set of ingredients, but totally change the flavor of things depending on how you season it. Oh, it’s a big more complicated than that, of course, but not much. Anyway, this is such a good soup! Love minestrone. Which reminds me, it’s been ages since I’ve made it. Thanks! Thank you John – we’re still eating the leftovers and it’s still delicious … at least we love it. Thanks for stopping by and for commenting! Thanks Summer – we really love it. I could use a whole pot of this today! We received a ton of snow last night and this looks so good! So sorry about the snow Abbe – but spring is right around the corner! Your photos make this look so tempting, Tricia! I love minestrone soup but haven’t made it in quite some time. This looks like a fabulous recipe! So colourful and full of flavour and a great way to use up veg too! You are right – love those veggies! wow ! Your soups looks amazing! And your photos are too. Have a great week Tricia! Thank you so much! Hope you are both doing great. I love minestrone soup but I can’t remember the last time I had it! Thanks for bringing it back to us with such a beautiful recipe. It looks amazing! It had been years for us too – I was really craving it 🙂 Thank you Monica! These pictures are magnificent Tricia. Just looking at them makes so clearly imagine the amazing aroma from your soup. I could enjoy this for breakfast, lunch or dinner. Soup, to me, is the best part of winter! Haven’t had minestrone soup in ages!! You make it so inviting and beautiful. Love the last photo. Thank you Angie – that shot was my husband’s suggestion so I’ll tell him you like it! The soup is delicious – hope you give it a try! this is my go-to soup… who doesn’t have tinned toms and veg in the fridge? I made a curry over the weekend with some left-over tomato dip of all things and it was glorious! Yours looks so beautiful. That aroma when the cheese melts into the soup! Yes! Yes! Yes! I know Dom – simple ingredients make a wonderful soup 🙂 Have a lovely week! 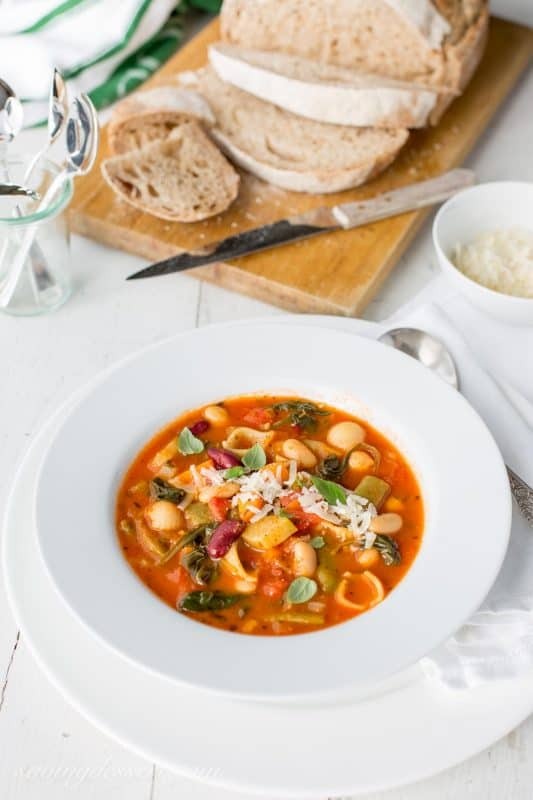 I don’t beleive we’ve ever made minestrone but your version looks so good it makes me want to. I like your last shot of it. Hope you give it a try Larry – it is a good one! What a beautiful bowl! Minestrone is one of my favourite soups. I love the pasta and kidney beans 🙂 Pinning! Gorgeous gorgeous gorgeous! sharing and pinning! It is filling and tasty Muna – hope you enjoy as much as we do!